This model caught our eye, the Latitude E6430S. It's a 14-inch notebook with a 1,366 x 768 resolution display. It's actually closer to a 13-inch in terms of chassis size. Indeed, while it's not an Intel Ultrabook, it might as well be - it has several Ultrabook features including Intel Rapid Start and Intel Smart Connect as well as an SSD. The unit boasts a new Ivy Bridge-spec Intel Core processor plus USB 3.0 and Bluetooth 4.0 as well as Windows 7. Surprisingly, the base E6430S only has 2GB of RAM, though we'd expect many buyers to upgrade this. The body has been designed for strength and there's a Strikezone shock absorber with fall sensor. The hard drive is also isolated with rubber. The keyboard is robust and is a typically comfortable Dell effort. As you'd expect, there's also Intel Vpro system management plus Dell's own tools for system admins including remote wiper. There's also an optional extra battery pack – adding the nine cell pack can whack the battery life up to a remarkable 32.7 hours according to Dell figures. Fast charging also means the standard three cell battery can be at more than 80 per cent capacity in less than an hour. 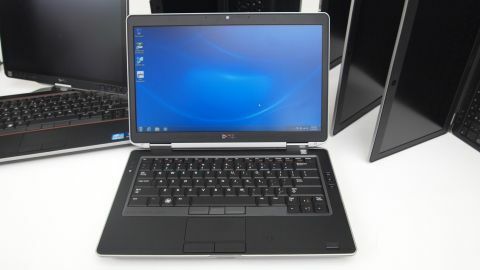 Dell has also announced refreshed Latitude E6320, E6330, E6430, E6530, E5430 and E5530 laptop too.